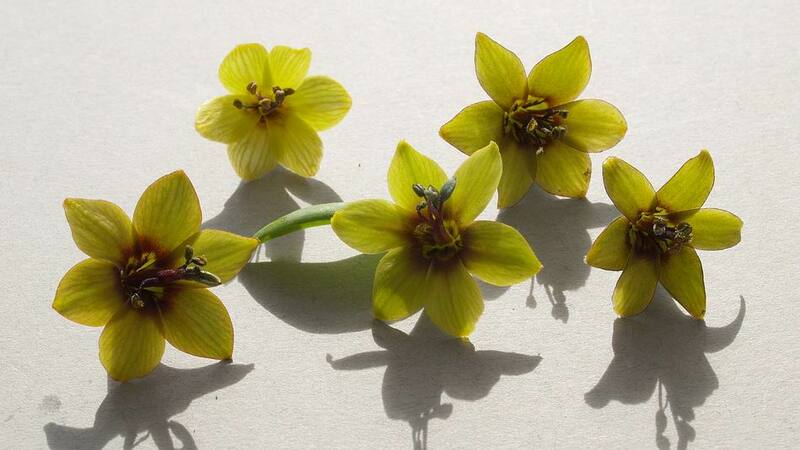 I collected a few flowers from the lovely Fritillaria sewerzowii which we grow both in the garden and under glass this shows some of the variation that we have in flower shape and colour. It is only when you get down and close that you start to appreciate the full beauty of many of the plants we grow and digital photography certainly helps. 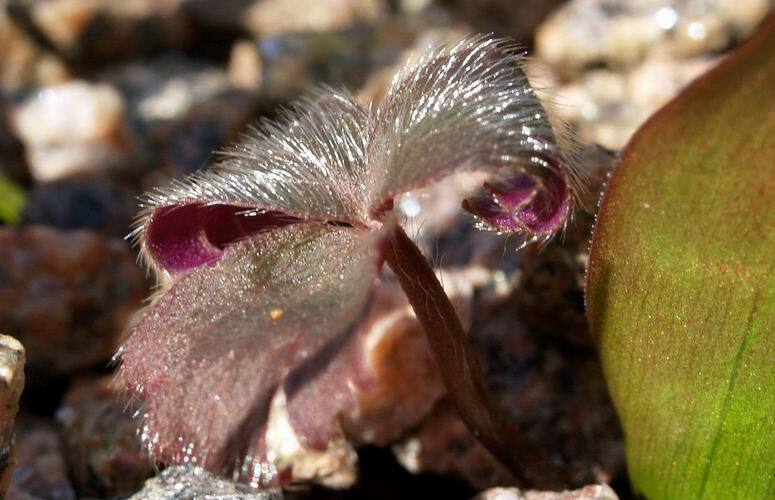 Did you realise just how hairy the emerging leaves of Anemone blanda are? Despite being a common, easy to get, easy to grow plant I just love Anemone blanda. I am happy to let it seed around in our gravel path, in fact I have been encouraging it by collecting the seeds when they are ripe and scattering them as I walk around. I especially like the blue colour forms but as with so many plants there is no finer sight than when you get a drift that displays the full range of colours. Continuing my walk around the garden I see that we have lots of Narcissus cyclamineus now establishing well. I am reminded that I must plant out this pot of seedlings when they are dormant - but before I do I will get my paint brush and pollinate them to help ensure a good seed set. In another frame many forms and hybrids of Narcissus cyclamineus are also flowering and I am tempted to release more of them into the garden to free up some of the frame space. This is one of the frames that hardly ever gets covered and it is where I also grow some of the crocus that prefer cool damp growing conditions such as Crocus pelistericus and C. scardicus. 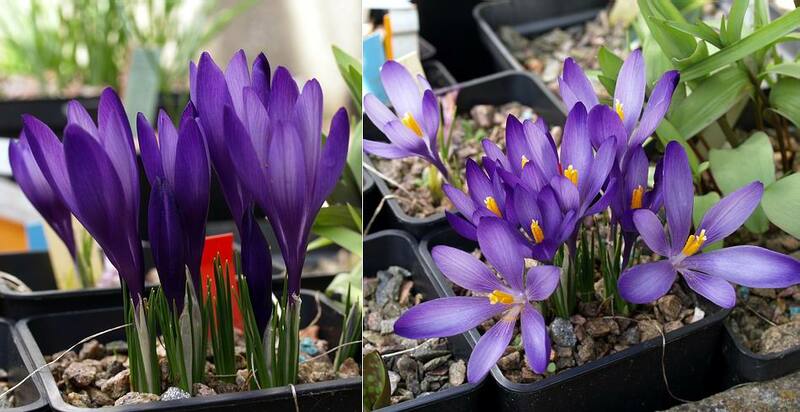 I should have been more proactive and had the cover on when we got the snow and gales the other week because most of the flowers of these beautiful crocus got very battered but this pot of seedlings have just come out so are unscathed by the bad weather. Although I grow most of my Crocus pelistericus and scardicus in frames I do have some planted around the garden as an insurance just in case I lose the ones in the frames. 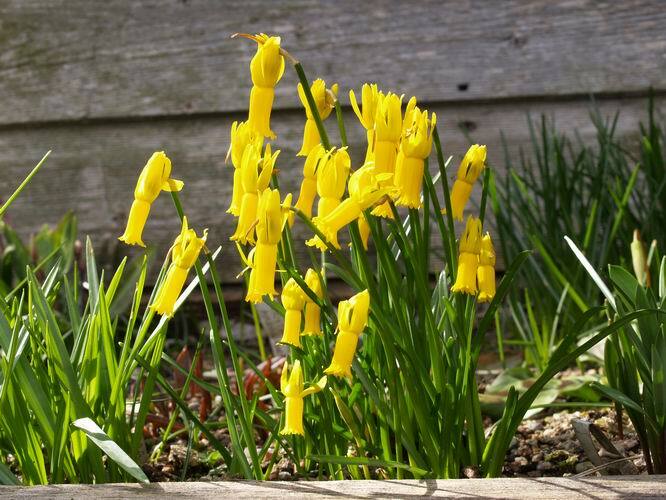 This type of insurance policy also works the other way around - where I might grow most of a bulb in the garden if it is difficult to get hold of replacements if I should lose it I will keep a hostage or two growing in pots like I do with Narcissus cyclamineus. The plantings that I like best are the areas where we have a mixture of plants all growing together like this. 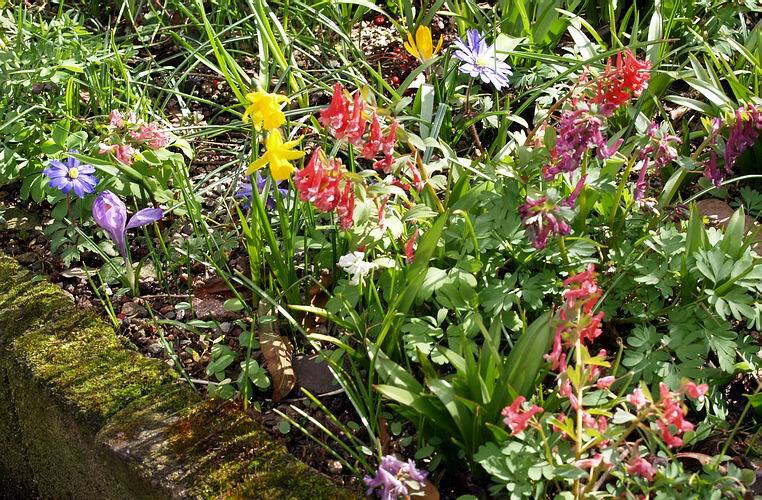 I have a number of areas planted up like this with a succession of spring bulbs giving a changing combination of colour and form from February until at least June. Unless I am trying to increase our stock of a particular species I just let the plants self seed in these areas. 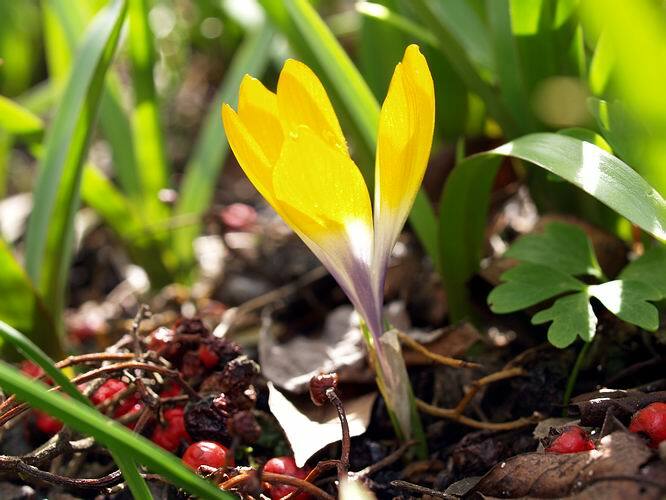 Can you spot the Crocus scardicus? Another area shows that it is not just the bulbs that make up these beautiful combinations. 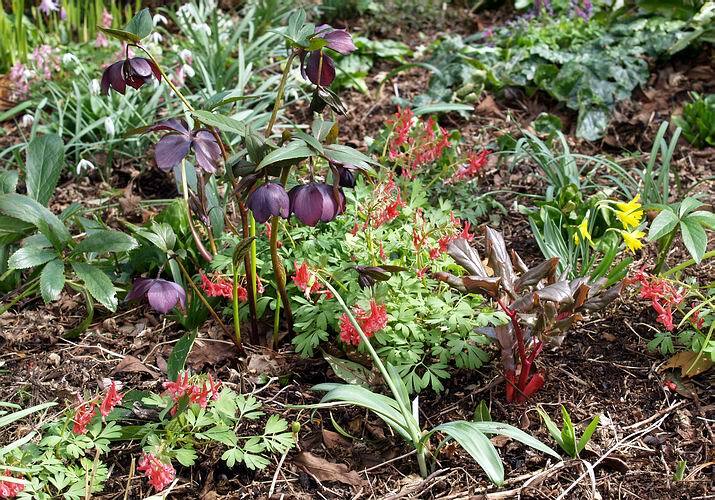 Hellebore flowers and the emerging leaves of peonies add to the scene. As I walk around I keep seeing jobs that I must try and remember to do such as splitting this clump of Scilla rosenii in the summer. We have many clumps of bulbs of all kinds which need to be split and I keep meaning to do it but I have put it off for long enough and this year I must start. This will involve digging out some entire beds and replanting them in the summer dormancy - watch this space. 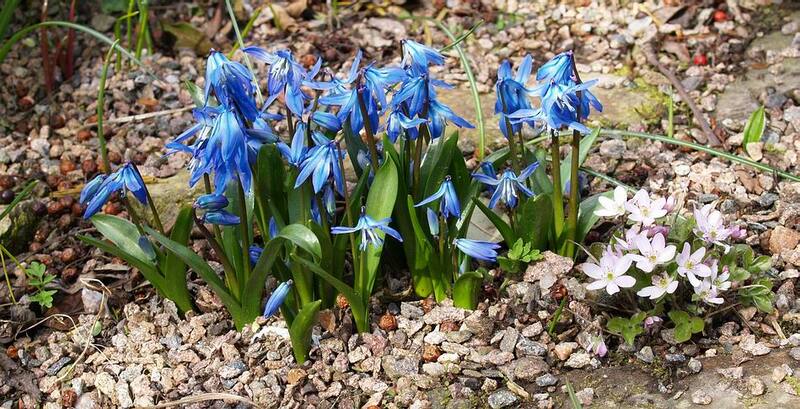 Keeping the Scilla company is a seedling of Hepatica japonica. I have never had much success establishing japonica in the open garden; it never seemed quite hardy enough for our conditions but I have a number of seedlings that are doing well for me now. I hope it will persist and that it is not just that we have had a few milder winters recently because it really brings a range of colours and forms that I have not got in the other hepaticas. 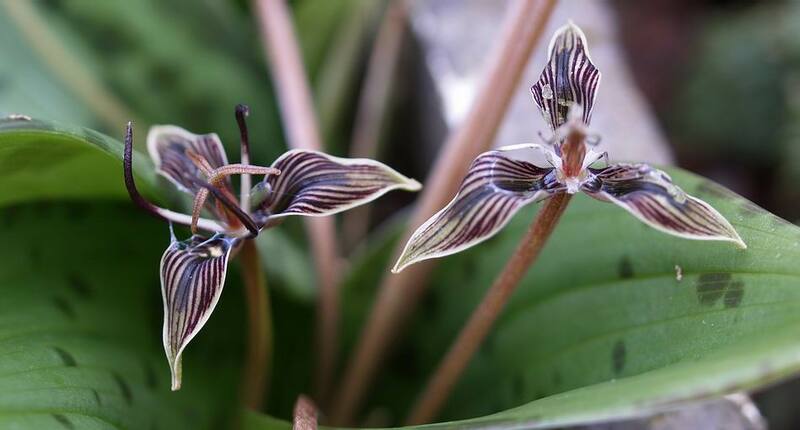 Scoliopus bigelowii has been flowering for months now and we have it planted in many sites all around the garden. Despite what has been written about it not producing seeds in cultivation we have always had good seed set on our plants. I do not always remember to collect it all before the slugs make off with it but I usually get enough to sow a pot or two. 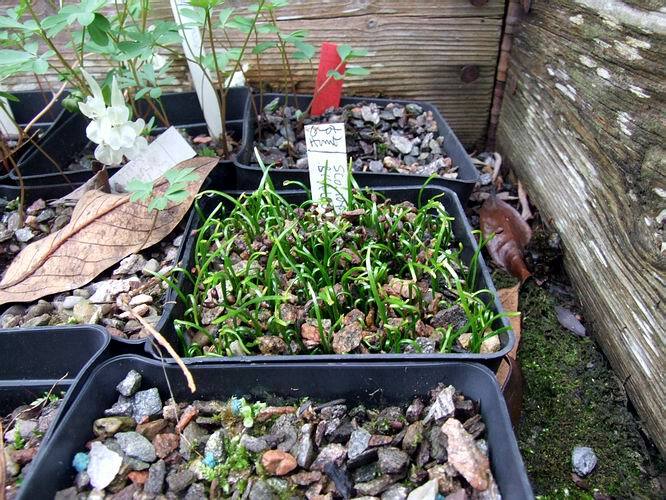 This is a pot of seed sown fresh last July - Scoliopus is one of the seeds that I do sow immediately it is ripe. Another task I have completed this week is to get all out troughs of Rhodohypoxis lifted out of the bulb house where they have over wintered in the dry. As some of them have not been replanted for a number of years I got stuck in to the task and now I have got them all done. The bulbs or more correctly corms were just on the point of growing and the tiny emerging white shoots helped me pick out the bulbs from the compost. I used my usual method of piling the compost into heaps so that the small bulbs run down the side and can be easily sorted out. 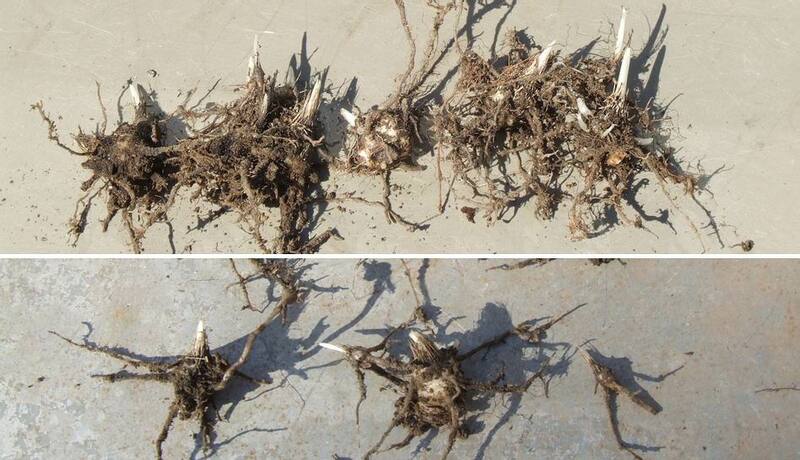 The bulbs put out small stolons of various lengths with new bulbs forming at the ends - some of the stolons can be 2cms long while others are very short and you get a congestion of tiny bulbs around the parent. 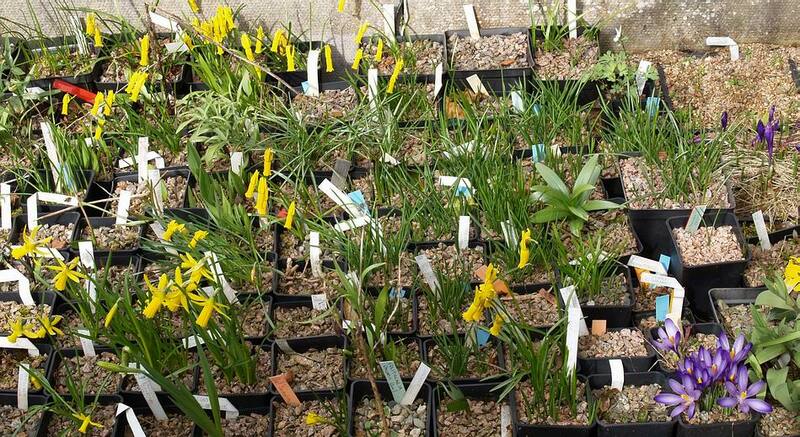 It is best to separate all these from the adult bulb and it is remarkable that even the tiny ones will grow on and flower this year provided you keep them well watered and fed in the summer months. Rhodohypoxis come from the Drakensberg where the winters are dry and the summers are wet; almost the opposite of a Mediterranean climate. 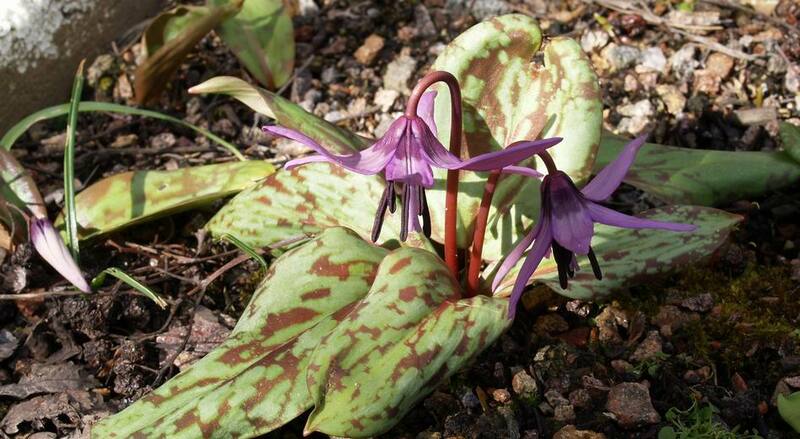 The bad weather also spoiled the early flowering forms of Erythronium dens canis but luckily we have many more forms just coming into flower now, like the ones above, and I hope that they will fare better and get good weather. 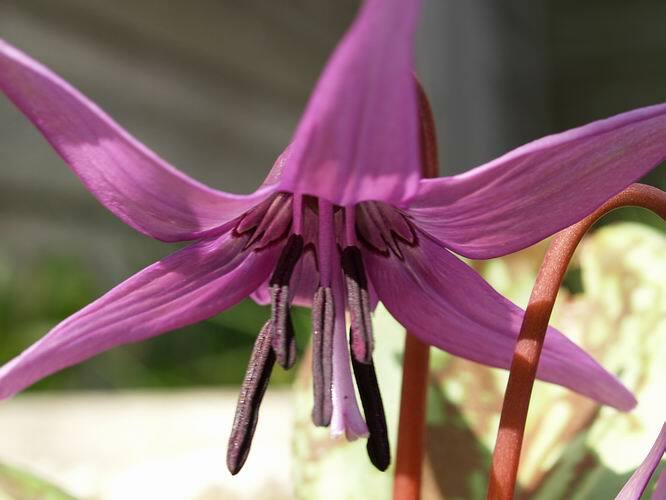 My first form of the far eastern relative of E. dens canis, Erythronium japonicum, is also in flower and as you will know if you have been following the bulb log through the years, it is a stunner. Just like the flowers of Fritillaria sewerzowii above when you raise plants from seed you will get variation in flower colour and shape but even better than that, you will get variation in how well they grow in your garden. Each successive generation you raise from your own seed will become better adapted to your local climate and garden conditions.